But a Brookings Institute report released the same month notes that while the cost of solar is declining, future projections for the US do not take into account cost increases that may come as the result of the lack of a US energy policy which has created a radical boom-bust cycle. The Brookings Institute points out that as US funding and incentives expire, federal spending will fall from $30.7 billion in 2011 to $16.1 billion this year. By 2014, federal spending expected to be roughly $11 billion, a 75 percent drop in five years. Despite the drop in funding, US renewable energy capacities will more than triple by 2036, according to the latest Energy Market Perspective (EMP) released by consulting firm Black & Veatch. The McKinsey report took a hard look at what appears to be a classic cycle of boom and bust after a decade of exceptional PV growth. The boom came with the aid of years of government subsidies that helped boost global installed PV capacity due to dramatically lower prices that made them more affordable to consumers. The price of PV modules dropped from more than $4 per watt peak (Wp) in 2008 to just under $1 per Wp by January 2012, and global installed PV capacity increased from 4.5GW in 2005 to more than 65GW today. “In less than a decade, the solar-photovoltaic (PV) sector has transformed from a cottage industry centered in Germany to a $100 billion business with global reach. Among the factors contributing to its growth were government subsidies, significant capacity additions from existing and new entrants, and continual innovation. PV prices have fallen dramatically, and by 2011, global installed capacity exceeded 65 gigawatts (GW),” states the report. The bust, according to the report, came when manufacturers rushed cheaper PVs into the market that prompted an oversupply and strained the price margins of many of the original solar players. The demand for PVs today isn’t keeping up with this over supply, and governments worldwide continue to scale back their financial support for manufacturing and installation as they cope with the aftermath of the economic meltdown. And a number of solar companies have already declared bankruptcy; with many more are hovering on the brink. Despite the appearance that the solar industry is on the back end of a classic “Boom & Bust” cycle, the McKinsey report suggests that the industry is only suffering from “natural growing pains” rather than experiencing near death throes. “Solar is entering a period of maturation that, in just a few years, will probably lead to more stable and expansive growth for companies that can manage costs and innovate to tap rising demand from multiple customer segments,” concludes the report. A number of things are driving the cost of PVs down, not the least of which is investment. Global investment in renewable energy reached a record $260 billion in 2011, up 5 percent from the previous year with investment in alone solar growing 36 percent to $136.6 billiondespite dwindling profit margins, several bankruptcies and waning stock prices, according to a January 2012 report from Bloomberg New Energy Finance. In the United States, total clean energy investments rose by 33 percent to nearly $56 billion, while those in China edged up 1 percent to $47.4 billion. The U.S. figure was heighten mainly by the last of the federal loan guarantees and grant programs which have now expired. In fact, the country's remaining support for renewable energy, the Production Tax Credit, is also scheduled to expire at the end of 2012, which has prompted a rush to get projects completed in 2012. After that Bloomberg predicts a slump in US investment in 2013. But 2011 was also bleak for some solar companies. Several solar stocks dropped by more than 60 percent as the price for PV panels cut profit margins for manufacturers. 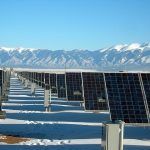 A report released April 18, 2012 by the Brookings Institution warns that as US federal spending on renewable energy dries up, more solar companies are likely to go bankrupt or be consolidated. According to the report, "Beyond Boom & Bust: Putting Clean Tech on a Path to Subsidy Independence," the era of clean energy spending supported by the American Recovery and Reinvestment Act of 2009 (ARRA) has come to an end at the same point that solar subsidies are being scratched in several European markets, reducing export opportunities for US solar manufacturers. “Manufacturing is likely to become more standardized and commoditized as the industry matures, reducing opportunities for upstream players to differentiate themselves. Our research suggests that the industry may consolidate across the solar value chain as participants compete for capital and access to customers,” concludes the McKinsey report. Installed renewable energy capacities will more than triple in the US by 2036, according toBlack & Veatch’s most recentEnergy Market Perspective (EMP) released in December 2011. The semi-annual EMP is a 25-year forecast of the North American energy market. According to the consulting firms Managing Director Robert Patrylak, US utilities and power generators are "adapting to a new normal" as new federal regulations come into play that have the prospect to boost solar power use. Those US regulations include new environmental air quality requirements that could potentially close 61,500MW ofcoal-fired power plants in by 2020. Coal currently generates 50 percent of the nation’s electricity, as opposed to 70 percent in China, while only 8 percent of US electricity comes from renewable energy. The EMP report concludes that these renewable energy percentages will more than double by 2036. The McKinsey research suggests that the overall PV market will continue to grow despite the fact that government subsidies are expected to continue to dry up. And the report is very specific as to where this growth is likely to occur if the solar industry focuses on five market segments. “This growth, over the next 20 years, will stem largely from demand based on viable stand-alone economics in five customer segments: off-grid, residential and commercial in areas with good and moderate sun conditions, isolated grids, peak capacity in growth markets, and new large-scale power plants,” concludes the report. McKinsey’s research indicates that scale will be crucial for solar manufacturers, noting that a few years ago scale meant needing 50-100MW of capacity to compete in the global market. Today, that figure is closer to 2-3GW. The report also predicts that industry partnerships will likely emerge between manufacturers and home builders, security companies, broadband providers, phone companies, or retail power providers. “Downstream players will have the greatest potential to generate value, particularly when demand for distributed generation hits an inflection point after 2015. 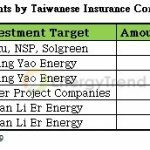 The biggest winners are likely to be those that target the highest-value customers in the distributed-generation segment, delivering quality products and services in multiple regions at scale while keeping their customer-acquisition and operational costs low,” concludes the report. “Indeed, companies have an opportunity to reduce their costs dramatically by adopting approaches widely used in more mature industries to optimize areas such as procurement, supply-chain management, and manufacturing. For example, our analysis suggests that the cost of a commercial-scale rooftop system could be reduced by 40% by 2015, to $1.70 per Wp from roughly $2.90 per Wp, and by approximately another 30% by 2020 to nearly $1.20 per Wp. Thus companies could position themselves to capture attractive margins even as prices for PV modules decline,” states the report. The McKinsey report puts its faith in continued technological and financial innovations that will take effect naturally in the market place to make solar profitable without the need for subsidies. In fact, the report suggests that recent bankruptcy and shut downs of PV companies – including some in China – is only a side show in the bigger scheme of global PV development. And as happened with computer circuit boards and other electronics, Moore’s Law will continue to bring the cost of PVs down. Indeed, the price of installed PVs has declined nearly 60 percent since 2009 and another 5 percent per year through the end of 2011. In the U.S., PV and other forms of renewable energy have taken a back seat to enthusiasm for developing the shale-natural gas industry as an alternative to importing oil. That enthusiasm, whether warranted or not, has damped political support for continued financial support of solar power through government subsidies. 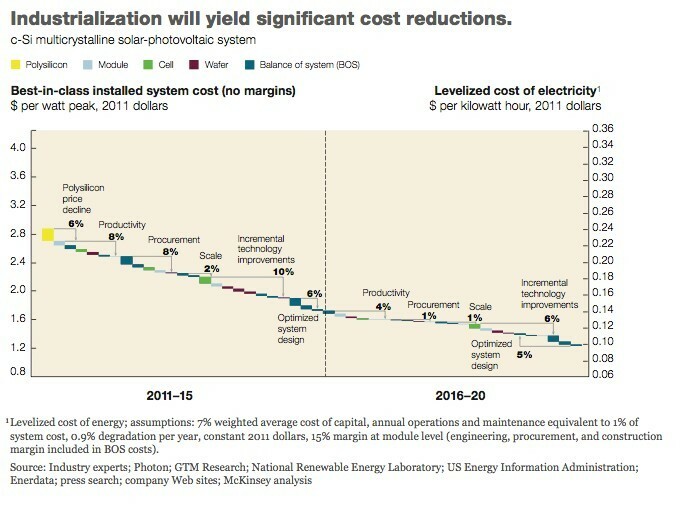 Nevertheless, the McKinsey Report suggests“the unsubsidized economic potential for distributed residential and commercial solar photovoltaic (PV) in the United States is likely to reach 10 to 12 gigawatts” by the close of 2012 at a profit while competing with rates charged by local utility companies. And that’s at current utility rates. But as those utility rates continue to rise in the U.S. and the cost of solar declines, the report predicts more Americans will switch to PV by almost 200GW by 2020. And that will require over $400 billion in new investment without the prospect of subsidies. Meanwhile, US utilities and developers “will continue building out renewable energy projects at a furious pace to take advantage of tax credit incentives as well as to meet state renewable portfolio standards," according to Robert Patrylak, Managing Director of Black & Veatch's EMP service in a written statement. The kind of money that has been spurring on the PV industry isn’t small. Global investment in clean energy hit a record $260 billion in 2011, up 5 percent from 2010 as investment in solar grew by more than a third despite shrinking profit margins and some very public bankruptcies, according to a January 2012 report from Bloomberg New Energy Finance. That growth was driven mainly by solar, where investment grew by 36 percent to $136.6 billion. 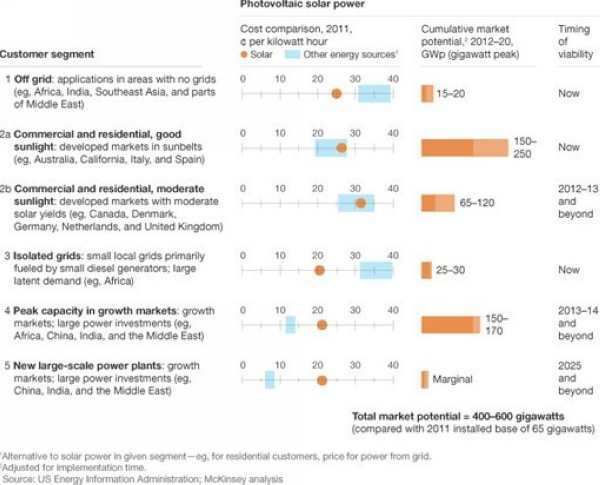 What the McKinsey report brings to the table is a look at estimating real market demand at a time when global policy changes are phasing out permanent subsidies that have created a level playing field for solar power development in the past. The report suggests that we are entering a new era of rapid solar deployment globally due to a combination of falling PV prices and disappearing government subsidies. But this new era for solar power without subsidies may be a good thing. The Brookings Institute feels the cut in solar subsidies in the US offers an opportunity for both the government and the solar industry to implement reforms that to only avoid a potential “clean tech crash” from the Boom and Bust cycle, but also accelerate technological progress and more effectively utilize non government resources. Once everyone gets over the fact that the government money is gone, it will force PV industry operations as a whole to become more efficient and more focused on those solar installation markets that make “return on investment” financial sense. Those changes, in turn, will unlock private funding and more creative financial innovations for PV investments. For the PV industry, this appears to be the new normal.